It gives me great pleasure to see so many of you from so many different nations as well as our citizens from all corners of the Land of the Brave. I bid you all a hearty welcome. This day would not have come about without the committed leadership legacy left by those before me. Permit me to start with my mentor, Founding Father of the Nation, Comrade Sam Shafiishuuna Nujoma. He is an icon of Namibia’s struggle for Independence and a man who brought peace to a nation that was tired of war. This foundation was solidified by former President Hifikepunye Pohamba who from our first meeting in 1962 until today when his term ends, has walked a path destined for leadership. It came as no surprise to Namibians that he is this year’s winner of the Mo Ibrahim Prize for African Leadership, as the prize was confirmation of what we in Namibia already knew that our President was deserving of local and international accolade. I cannot leave out the two former First Ladies, Madam Penehupifo Pohamba and Madam Kovambo Nujoma. 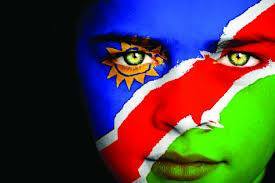 Thank you for mothering Namibia. You hold a special place in our hearts and stir our emotions when your names are mentioned. I would like to thank the rank and file of the SWAPO Party for working tirelessly and selflessly to ensure electoral victory for the SWAPO Party and its Presidential candidate in last year’s elections. I thank the people of Namibia for having given me a clear mandate so that today, I can stand in front of the world to take this oath. I take this oath on behalf of all Namibians and promise to serve all Namibians without exception. No Namibian must feel left out. You exhibited your patience and patriotism by enduring extreme conditions in order to cast your first electronic ballot. It is that same commitment that brings you to this stadium and for that, I thank you. 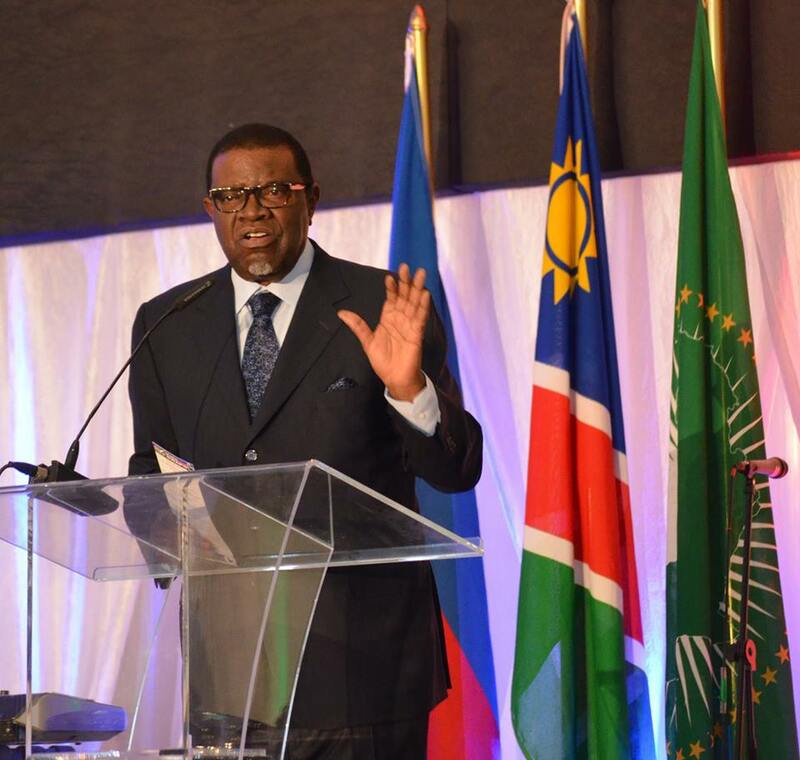 I have of often said that Namibia is a Child of International Solidarity, friend to all and enemy to none. Twenty-five years ago, our struggle for the independence of our country was concluded. The illustrious sons and daughters of Namibia fought the battle for Namibia’s emancipation on many fronts. I would also like to thank all of our visiting Heads of State and international visitors, who have come out in large numbers, for your solidarity. It would take me all day to describe the role either you or the country you represent has played in the past and present. 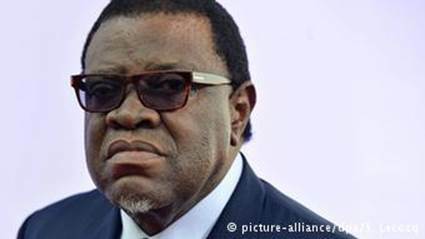 Il partito di governo ha vinto le elezioni presidenziali in Namibia, Hage Geingog è il nuovo Presidente con l’86,7 per cento dei voti. Il premier si è aggiudicato senza difficoltà le ultime elezioni presidenziali. 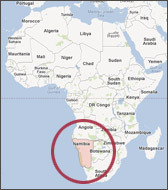 Il suo partito, il South West Africa People’s Organization, domina ininterrottamente la scena politica nazionale dall’indipendenza ottenuta dal Sudafrica nel 1990. Namibia's ruling party SWAPO has been in power for 24 years and is widely tipped to win Friday's legislative and presidential elections. However support for the party at grassroots level is decreasing. For Henning Melber, a German-Namibian political science professor at the University of Pretoria in South Africa, the parliamentary and presidential elections being held on Friday (28.11.2014) will bring no surprises. Melber has been following Namibian political developments for years. 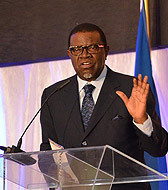 For him it is clear that the ruling party SWAPO (South West African People's Organisation) will win with an overwhelming majority and SWAPO's presidential candidate, current prime minister Hage Geingob (73), will prevail in the race against eight other rather weak candidates. The incumbent president Hifikepunye Pohamba, who has already served two terms, is barred by the current constitution from running again. Since independence, SWAPO has won every election with either a two-thirds majority or even 70 percent of the vote.